=►It should be a thick gravy and dip all cauliflower florets. Keep it aside for 10min. =►Heat 6 tsp of oil in a non stick pan, fry cauliflower till it turns golden yellow color. =►Heat 2tsp of oil in a wide pan, add sliced garlic, onion, spring onion and little bit salt. =►Saute it well till the onion turns slight brown color. 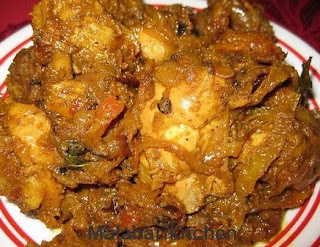 =►Add turmeric, chilly powder, soya sauce, tomato ketchup and red chilly sauce nto it. 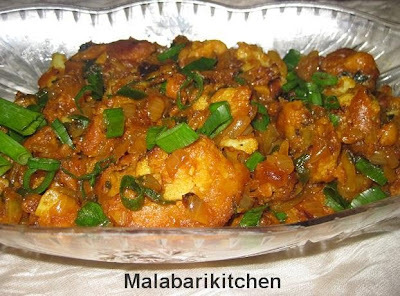 =►Mix it well for 2-3min and add fried cauliflower into it. =►Mix everything properly and cook it for 2-3 min on medium flame. 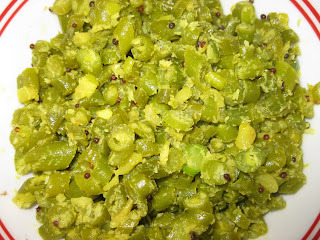 =►Garnish with chopped spring onion and serve it hot with plain rice, fried rice etc. Delicious Gobi manchurian,looks very inviting.